The quote on the cover of this book states, ‘This may be the most important book you will read all year.’ Usually this kind of hyperbole brings out the curmudgeon in me but I know Katharine in her capacity as a children’s author so I began by reading Chapter One on line. My heart skipped a beat as Katharine’s clear and accessible prose began to tell the events that lead to the brutal murder of a young man with severe epilepsy called Kevin Davies at the hands of his so-called friends. And so my journey into the world of disability hate crime began. 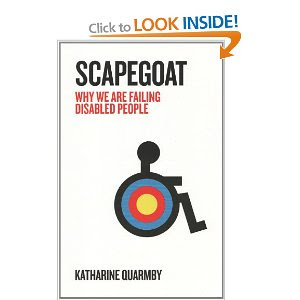 In 2007 Katharine had started to investigate a number of violent killings of disabled men and women across the UK. As news editor of the disability magazine, Disability Now, she was able to put together the first national dossier of such crimes that year, following it up with an investigative report on disability hate crimes, Getting Away with Murder, for the charity Scope and the UK's Disabled People's Council, in 2008. There are many upsetting cases of extreme bullying and violence in this book. Christine Lakinski, a woman with learning and physical disabilities collapses outside her home and a neighbour Anthony Anderson thinks throwing water over her, covering her in shaving foam and urinating on her will make good Youtube material. All this is videoed on a mobile phone as she is left to die in agony. There are other examples in the book of people recording their crimes on mobile phones or hounding on social networking sites. Katharine invites us be clear- headed and face up to our prejudices as we confront what she calls ‘the ugly truths about our society’ such as the obsession with the body beautiful. Read this book and weep then get angry and get writing. We need some strong YA fiction to support and illuminate this issue. Thank you for this review, Lynda, and for drawing attention to this book. Not happy reading, but not to be avoided, either. I'm currently working with a publisher on an idea for a series about a boy who happens to be disabled, but the main point about him is his personality and the adventures he has. It's for 7-9s, especially boys, and one of my main motivations is to treat kids with disabilities in books as - kids. I will be reading Katharine's book, as part of my research. Words fail me... And we flatter ourselves we've put the Dark Ages behind us. Thank you, Lynda and katharine - and more power to your arm, Rosie! Totally agree that this is a subject we shouldn't ignore. I've just written a YA book set in the not too distant future where society's obsession with physical perfection leads to disabled children being kidnapped. I don't want to give away the ending but I wrote it because, like Katharine, this is something I feel really strongly about.